It’s Jan. 3, 2019, inside the AT&T Center in San Antonio, and Kawhi Leonard, on the other side of the layup line on the court where he once hoisted a championship trophy and a Finals MVP, stares into the distance and claps alongside his new Toronto Raptors teammates as an ocean of cheers — directed at guard Danny Green, the other piece of the deal that shipped Leonard away from San Antonio after his trade demand — turns into boos. Leonard wears the same distant and sad-eyed look throughout the tribute video (“I didn’t look at it,” he says. "I don’t ever look at the Jumbotron before the game.”), the cascade of jeers, and the game that ended in a cathartic blowout victory for the Spurs. Only while leaving the court did Leonard betray any emotion, smilinghis wolfish smilewhile embracing his former coach, Gregg Popovich, and sharing a few words that, you guessed it, remain private. Better. Leonard, a marquee free agent on the tail-end of a one-year partnership the Raptors hope to extend this summer, filters every experience through one lens: Could it help him grow as a basketball player? If so, bring it on. Anything else is a distraction he relentlessly sifts out, as irrelevant as the many things that rule the lives of the modern player and person: social media, branding, lengthy interviews and external gratification. Even his return. But Serge Ibaka, who has faced his own return to the Oklahoma City Thunder, sensed Leonard was feeling the weight of the moment. “When you used to play at some place for so many years, you got fans coming, attention of the media, in your mind it’s like, ‘I wanna play my best basketball.’ It’s a lot mentally.” But according to multiple teammates, Leonard never brought it up. It’s the Kawhi way: to unspeak things out of existence. Leonard, the rental that cost Toronto DeMar DeRozan, the most beloved player in franchise history, might stay. He might go. Maybe he already knows. Maybe he’ll weigh everything after the playoffs and a potential Finals run. And we still aren’t sure what really happened between him and the Spurs’ medical staff. But the Raptors have thrived despite the questions, winning seven of their last eight regular-season games before Saturday’s Game 1 matchup against the Orlando Magic in the first round, while potential foes like the Celtics, Sixers and Warriors deal with tension that likely won’t be resolved until July 1. From his risefrom obscurity to superstardom to the Raptors marching to the playoffs drama-free, the rigidity of Leonard’s focus helps him bend reality to his will. Leonard’s ambitions, if out of sight, have always been grand. As a relatively anonymous junior at Martin Luther King High School in Riverside, California, he told Parks he wanted to be the best player in the world. Perception couldn’t trump reality on the hardwood. Imbued with a self-belief and a willingness to zone in on his weaknesses, Leonard was already developing what former Spurs assistant Chad Forcier calls the courageousness that allowed him to learn a move in practice one day and try it in a game the next day. It’s been over a decade now, so Tim Sweeney, Leonard’s coach at Martin Luther King High School, can laugh when he recalls the game after the game. King, riding an unprecedented high behind Leonard, defeated Mater Dei, the No. 1 team in the nation, only to find itself trailing by double-digits late in the third quarter against Tesero, the 19th-ranked school in California. “All right,” said Sweeney, stopping the timeout in its tracks. “Go!” King came back and won by nine before losing to Westchester two games later, sending Leonard San Diego-bound. A solitary figure stands still in an empty court and unfurls his shot eight feet from the rim, working on his form. Then he turns his back to the basket and hones his post moves, before drilling jumpers off the dribble and the catch. Leonard still has the code to the practice facility at San Diego State University, where thousands of clanked jump shots turned him into a 3-point sniper. He works out there every summer. “It’s like he’s preparing for Game 7 of the NBA Finals,” says former Aztecs coach Steve Fisher of Leonard’s workouts, which are now the stuff of legend. In high school, following a three-hour practice over Christmas break, Sweeney couldn’t get the school’s alarm system to re-activate. That’s when he found a piece of tape stuck to a latch on the door. He took it off and went back into the control room. Still no go. It turns out that Leonard and his pals — including Tony Snell, who now plays forward for the Milwaukee Bucks — were sneaking back into the gym at night, running drills and playing intense three-on-three sessions. But this season, Leonard has occasionally lifted opened the curtain for his teammates, giving the organization its first inside look at the routine of a Finals MVP. Anunoby, for one, is constantly picking his brain. “What’s he seeing from me? Am I forcing things? Am I using my hands too much? Being too passive? Too aggressive?” He takes note of how detail-oriented Leonard is, his economy of movement, how he always finds the right moment to get his hands on his opponents’ flimsy bounces. “He just knows what his work day is and there's nothing that bothers that work day for him,” says Raptors coach Nick Nurse. “He's not ever rushed or panicked or trying to get out early or any of that stuff. He knows what his work day is and he's not leaving until he gets that thing done, regardless. He just accepts that.” According to Fisher, Leonard is a culture-setter by way of mere existence, an example every coach can point to as an ascent rooted in good habits pushed to their logical extreme. 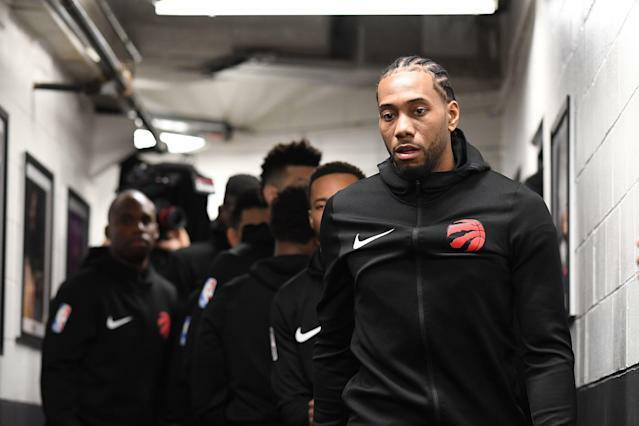 On Feb. 10, three days after Kevin Durant warred with the media over rumors he was headed to the New York Knicks, Kawhi Leonard stood in the visitors’ locker room at Madison Square Garden and batted away free-agency questions. “I want to focus on this season. We’re going to get there. We can talk about the game.” Eventually, most of the questions that could have served as distractions stopped being asked.